Manarola behind us – the hotel we stayed in is to the left, in the very topmost row of buildings! I almost can’t believe we hiked all the way up there! A visit to the Cinque Terre had been on my bucket list for years. 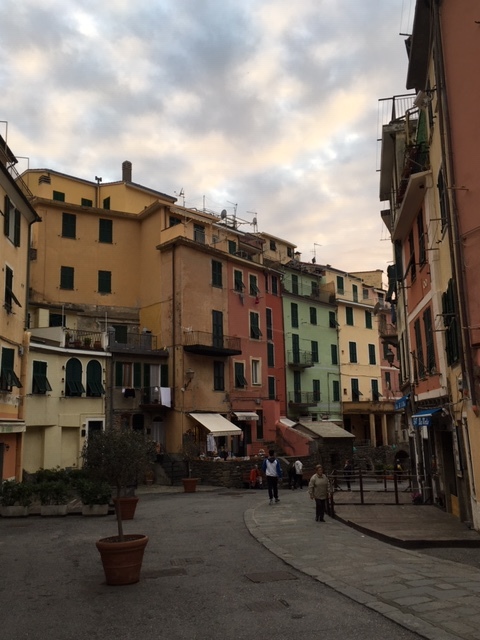 I’m not entirely sure when I first learned about these five small villages on the Ligurian coast of Italy – maybe a Rick Steves show? – but from that first moment I wanted to go. These past two days my dream came true. 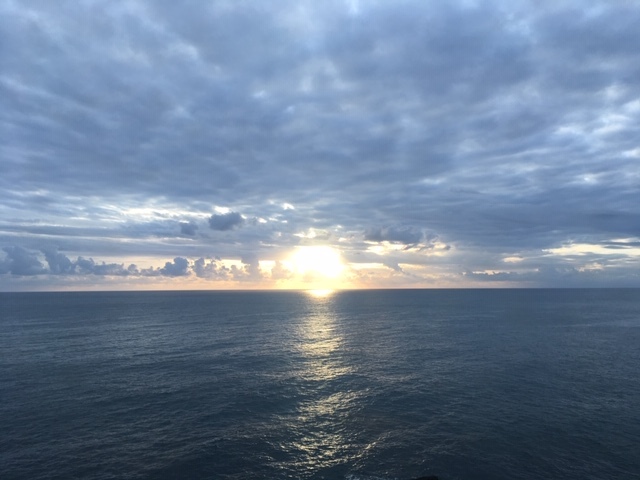 We were originally scheduled to go to the Cinque Terre last week, but after some bad storms and flooding we were warned to wait and go a bit later. After looking at the weather forecast we picked November 9 & 10 as the two days with the best weather we could hope for, and were thankfully allowed to change our train tickets for free to the new date. There was still a possibility of rain showers on the new dates, but nothing we felt we couldn’t deal with. The train ride from Florence yesterday morning took around three hours because it turned out the train stopped at literally every station on the way to the Cinque Terre. One of the stops though was Carrara, where the fine, pure white marble that Michelangelo used came from, and is still being quarried today. We at first thought the white on the side of the mountains was snow until we realized that what we were seeing was marble. 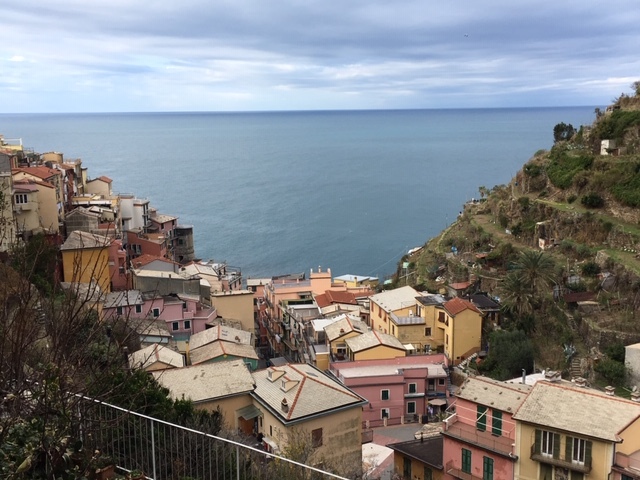 Our first view of the Mediterranean Sea, from the Riomaggiore Station. 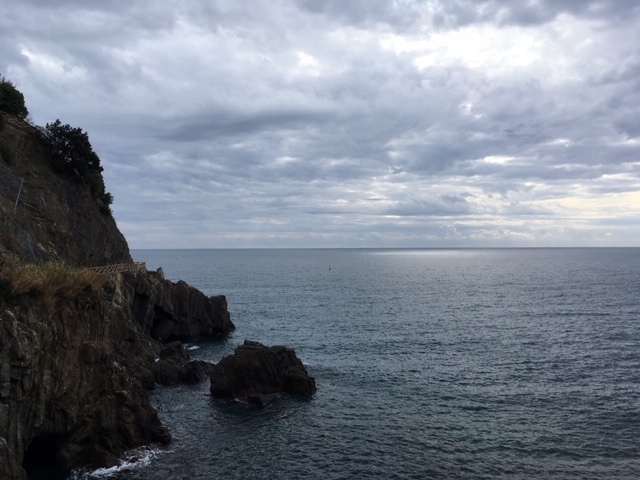 Both Brett and I gasped like children when we finally stopped in Riomaggiore and got our first glimpse of the Mediterranean Sea. We hadn’t realized until then how much we had missed seeing the ocean. Even with cloudy skies the water was a beautiful shade of blue that reminded us of Hawai’i. 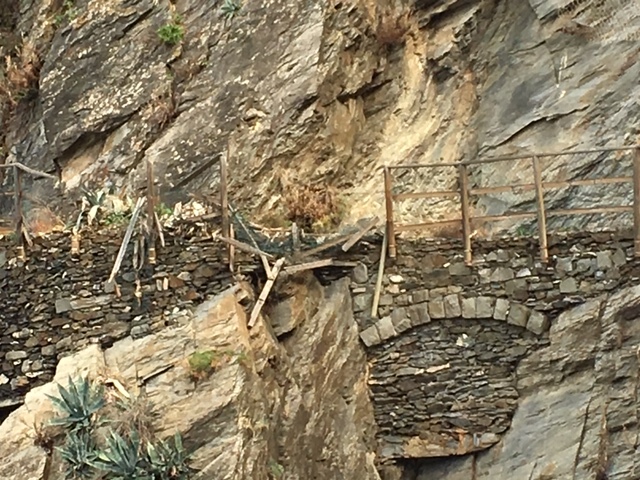 The dangerous condition of the trail between Manarola and Corniglia is visible; a short way along to the north the entire trail was missing. We were happy to use the trains on our visit. 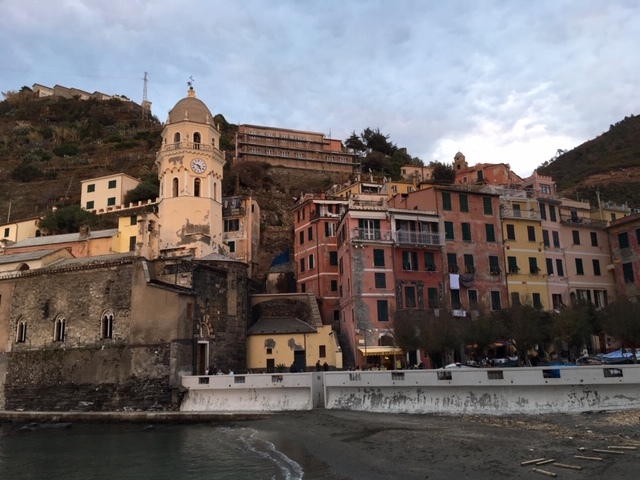 We purchased our Cinque Terre park passes in Riomaggiore, the southernmost of the five villages, and then hopped on the next train for Monterosso, the most northern village of the five. The passes allowed us to get off and on the trains at our own pace, a good thing as all the hiking trails through the Cinque Terre were closed due to storm damage. 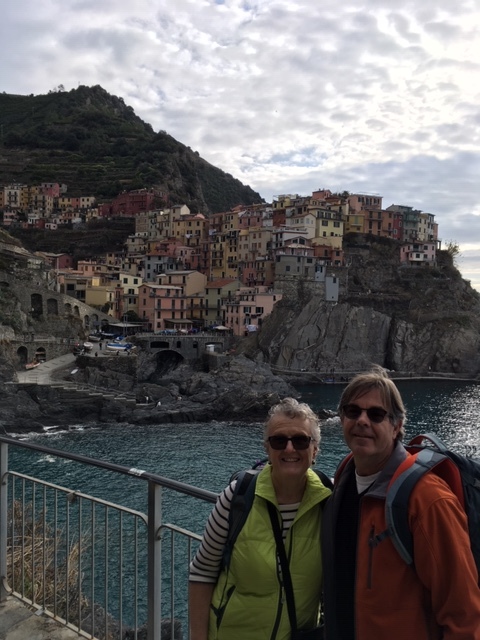 Our plan was to grab some lunch in Monterosso and then walk around for a bit, then go to the next village, Vernazza, and finally head to Manarola, where we we had a hotel reservation for the night. 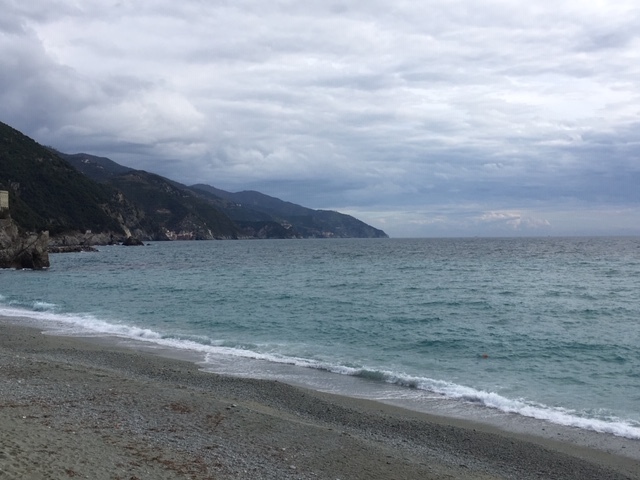 The beach at Monterosso, like everything else, was deserted. In spite of the clouds, the sea was still a beautiful shade of turquoise. Entering Monterosso was like entering a ghost town. It’s a true beach town, and the season had officially ended on November 1, so houses and stores were shuttered, restaurants were closed, and there were almost no people anywhere. We were hungry and eventually found one open restaurant and had a pretty nice lunch – fish-stuffed squid ink ravioli with shrimp for Brett, and a grilled vegetable pizza for me. It was also kind of sad though because we were the only diners in the restaurant. After lunch we walked back along the beach to the train station to go to Vernazza. The train arrived and we climbed on and took our seats but then noticed that almost no one else had gotten on. Hmmm. 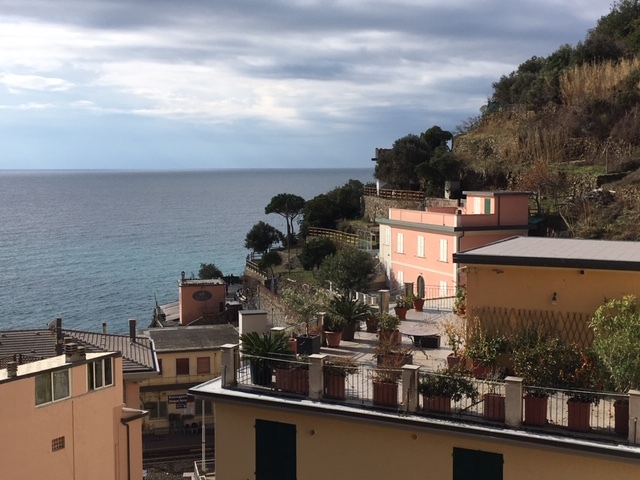 As the train picked up speed we discovered that we had accidentally gotten on an express train which had been delayed by storm damage further north, and had ended up arriving at the Monterosso station at the same time as the scheduled local down to Vernazza. There had been an announcement, but as it was all in Italian we had no idea about the change in the train schedule. 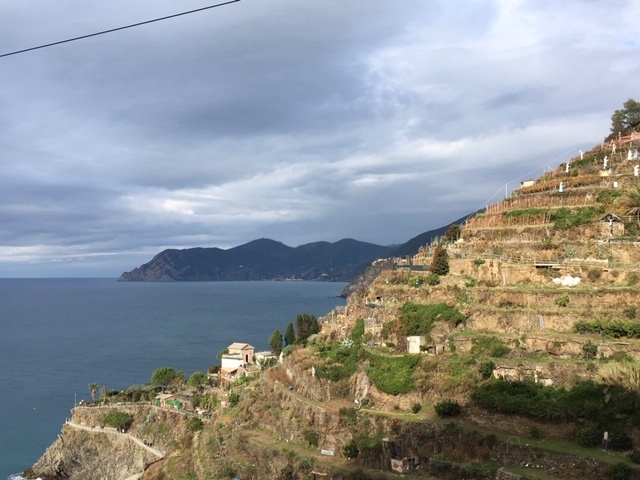 We watched forlornly out the window as we sped through the Cinque Terre and finally stopped at La Spezia, where after a short wait we caught the train back and eventually got off at Vernazza. It was getting close to sunset when we arrived in Vernazza. The beautiful sunset made up for the mix-up with the trains. The little village of Vernazza was lovely and picturesque. 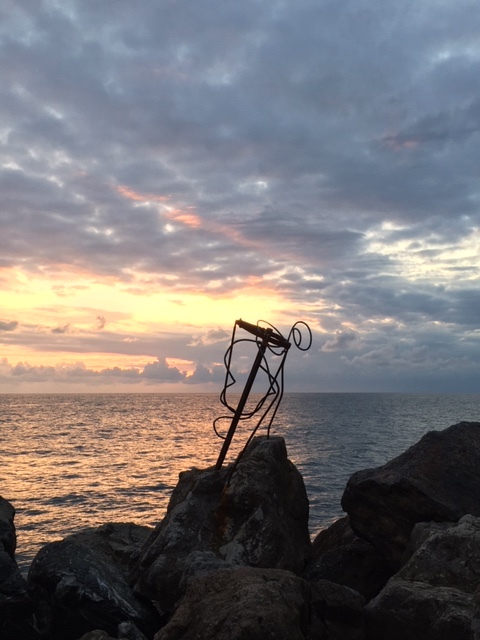 We wandered around for a while, had some gelato, walked to the harbor to watch the sun set, and then hiked back up the hill to the station and headed for Manarola, where we had a hotel reservation for the night. Dark was coming on fast when we arrived in Manarola. 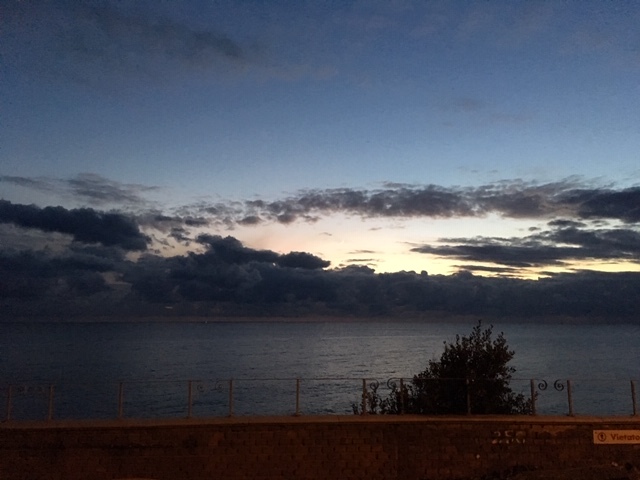 It was nearly dark when we got off the train in Manarola, and we were a little frightened when we realized we had absolutely no idea where the hotel was. We punched it in on our GPS, and headed off in what we thought was the right direction, but after walking down a street for a while and climbing several flights of stairs up the side of the hill we looked again at the GPS and discovered we were nowhere near the hotel! We climbed back down into town and asked at one of the restaurants for directions and got ourselves headed in the right way. We eventually found the hotel – the owner was looking for us out the window! We were the only guests that night, and were given an absolutely lovely room with a private terrace. To say we were exhausted at that point from all the train rides, hiking and climbing we had done that day would have been an understatement. We both quickly changed and climbed into bed and were asleep in moments! One of the morning views from our hotel terrace. The hotel’s owner also owns and works daily in the terraces across the way. The winding street to our hotel that we had to maneuver in the dark – I was using the flashlight feature on my phone to help us find our way! The stairway in back goes up to the hotel. One of the spectacular views on our way back down into the village. Cafe latte for me, an Americano for Brett! Coffee in Italy is beyond delicious. We woke up this morning to sunshine and stunning views from our terrace, which made all that climbing in the dark the night before worthwhile. The hotel provided coffee and some biscotti in our room for breakfast, so we had those, then got dressed and headed back down the hill for some more coffee. The walk down was much nicer in the light and provided some stunning views. After our coffee we wandered through the village for awhile and walked along a path around one of the cliffs. We were able to see from the path how thoroughly damaged and in what dangerous condition the trail was in and why it had been closed. The north side of Riomaggiore. We would have completely missed this view of Riomaggiore if we had turned right instead of left to head up the hill into the village. 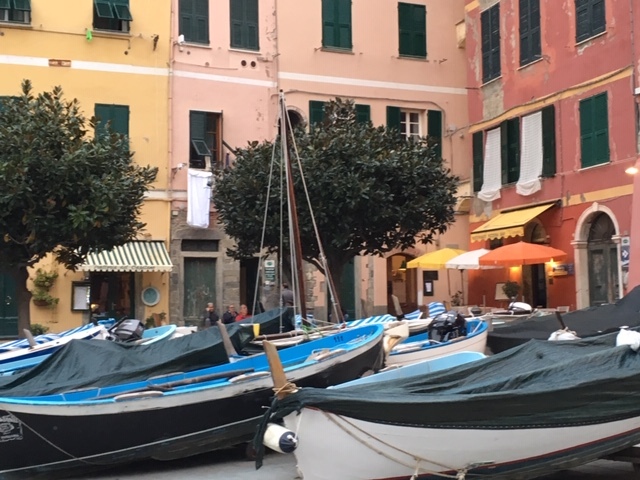 Brett and I had originally planned to first visit the village of Corniglia, which sits between Vernazza and Manarola and then go to Riomaggiore. 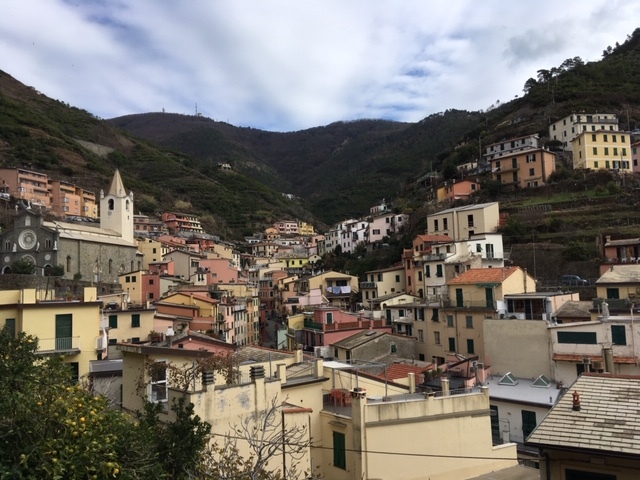 However, we realized neither of us wanted to do the 30-minute Stairmaster climb from the station up to Corniglia, nor did we want to wait anywhere from an hour to an hour and a half for a bus to take us up (and then wait as long for the bus to take us back down). So, it was straight on to Riomaggiore from Manarola. Since we never seem to do things the easy way, instead of turning to the right from the Riomaggiore station and walking through the tunnel over to the harbor and village center, we instead turned to the left and headed up a steep hill that wove through the village but eventually brought us down to the village center. We rewarded ourselves with a wonderful lunch of traditional Ligurian pasta (Brett’s with mixed seafood, mine with fresh pesto) and then wisely took the tunnel back to the Riomaggiore station where we caught the train back to Florence. I did not want to leave Liguria without eating pesto. 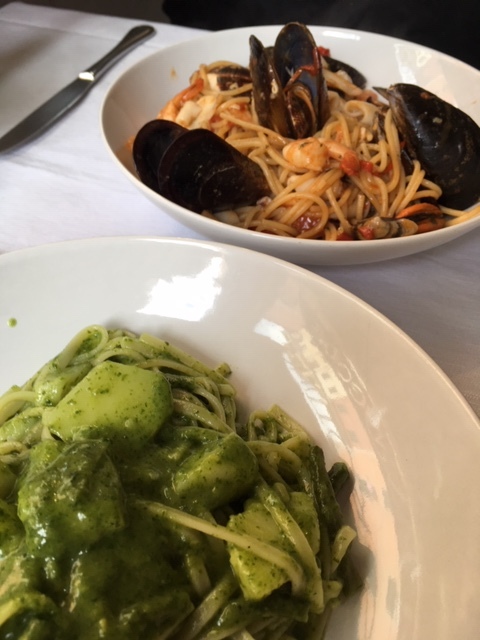 This traditional dish of linguine with fresh pesto, potatoes and green beans was perfect; Brett had traditional spaghetti with assorted seafood. Although our first day turned out to be kind of crazy (and exhausting), the morning walks/hikes through Manarola and Riomaggiore were wonderful and both of us left Liguria feeling like our visit had been a success. It didn’t rain, we saw all the villages (if only from afar in the case of Corniglia), and we got to eat traditional Ligurian cuisine. Dreams really can come true! We also wandered a small city (Assisi) in the dark of night at this time of year following our GPS to a restaurant we had seen earlier. SO. DARK. And we also noticed the farther from the cities we got, the less people spoke English. But it all turned out OK, as did your adventure…great memories. And the pesto. There’s nothing like it. That was my favorite thing after the gelato. Well, that and the tiramisu. So many good things to eat and drink in Italy. Walking up those hills and climbing all those stairs in the dark was an adventure, that’s for sure. It didn’t help that we were exhausted at that point either. But, the hotel more than made up for it. We chose a wonderful restaurant in Riomaggiore too, and the pesto was so good. It was much more delicate than what I have had before so I’m going to be looking for a new recipe! We really did luck out with the weather – we had expected rain but it never showed up. It was also warmer than expected too. So glad we got to go! What an adventure! The streets look very narrow and I don’t set a single vehicle. Is all the traffic on foot. I know you mentioned a bus but I don’t see any place a bus could go. The damage looked extensive, is that kind of weather normal for the region or can we chalk up another one for climate change? It really was an adventure, both good and in ways we had not expected. We occasionally saw a car, but they were so rare that they surprised us when we did see them. 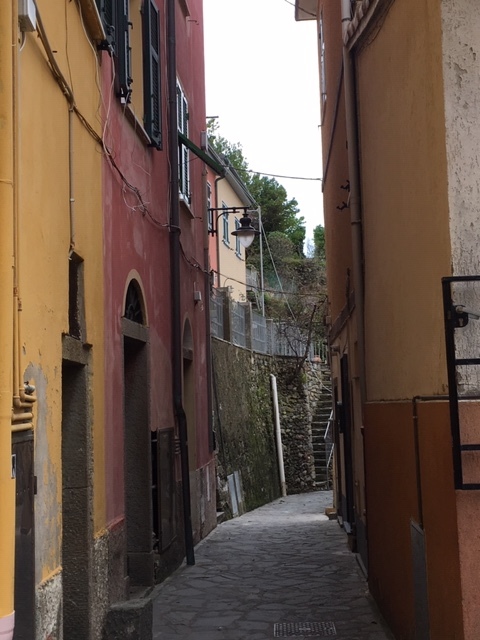 Most residents walked up and down those hills every day, and the took train to La Spezia or up north to do their major shopping (there were small markets in each town for basics). The damage on the trail from Manarola to Corniglia was quite extensive. The trail is supposed to open next year, but we couldn’t imagine how they will get it down as parts of the trail were literally wiped out by landslides. I think climate change is definitely playing a role, and the topography there (steep hillsides) definitely plays a role as well. I was in awe of all the terraced farmland going up the hillsides. Nothing is wasted. I love how you write! This seems like a dream to see those houses and buildings amongst the hills and rocks and the ocean! You saw the Mediterranean ocean!!! What a dream! I was a little afraid before we went on this getaway that after wanting to go for so long that it wouldn’t be what I expected, and I would end up disappointed, but that did not happen at all! Even not being able to hike the trail, even part of it, between the villages was not a disappointment (especially after I saw the condition of the trail in a few places). It really was a dream come true for me. Like Katherine above, I feel like I was reading an adventure story . . . wonderfully done! Oh how I love these type of travel mishaps, which while stressful at the time, make for the most wonderful memories! The trail from start to finish is a mess right now from all the storms the past few years. In places we could see where the trail has been wiped out by landslides – I’m not sure how or when they will be able to fix those places even though they say the trail will reopen next year. I am very afraid of heights, and after seeing some of the trail I was sort of secretly glad we were taking the train – I think I would have been terrified in places and maybe not able to move forwards or backwards. I can’t get over either how much we climbed, just through the villages. Brett’s phone registers how many flights of stairs he climbs and I think the first day it registered almost 20 – most of that though was from climbing up and down the steep roads in the villages. It really was as pretty as all the pictures I’ve seen, and can only imagine how it would look in bright sunlight versus the overcast we had while we were there. I am so grateful that we got to go – we had a very good time and a satisfying visit. 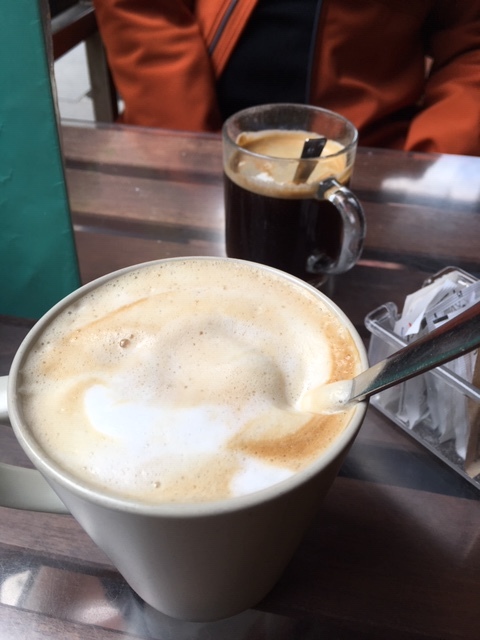 The cafe latte was so good – so much foam! I only wish I could get a latte like that in the U.S. (well, I probably can, but just haven’t found it yet). We bought the stovetop espresso maker, and I’ve told Brett I’d like a good milk foamer to go with it (but that can wait until we’re in the U.S.).